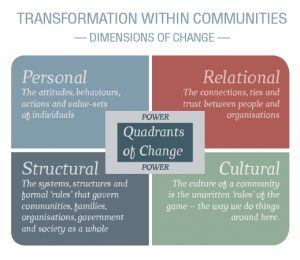 For lasting transformation to happen within communities there are four key dimensions of change to consider; personal, relational, structural and cultural. Over time, these inter-related dimensions must all be influenced as part of any successful and enduring community change process. Power also has a significant impact on what, and how, things happen in communities and this can be seen as tightly woven into all four quadrants as noted in the diagram below (click image to enlarge). While one-off or smaller incremental or circumstantial changes may build on and layer together over time to create the conditions for substantial change within communities, it is important to note, that in isolation these one-off changes do not create stronger, more resilient communities in and of themselves.